Becca Chandler leaves a self defense class only to discover someone getting beaten up in the carpark. She decides to step in without realising just how much this one good deed will change her life. Chris Merrick is no ordinary guy, his reaction to the water she gives him after rescuing him is only the tip of the iceberg. Chris has three older brothers, their parents are dead and the boys are marked for death. All four of them are powerful elementals, each having one element they are particularly attuned to – water, air, fire and earth. This can be incredibly dangerous, especially now when it appears that deals which have held for years are shattering, with violent consequences. Things though haven’t been simple for Becca for a while, and she is finally getting used to the gossip. Into her increasingly complicated life comes Hunter, a strange new kid who has an appealing and mysterious way about him. He helps Becca when she needs it most. As things get more dangerous Becca realises she doesn’t know who she can trust. Then there is her secret. Becca is a little different from many heroines as she is the one who steps up to do the rescuing, though in the interest of full disclosure she does get rescued at some point as well. She is a fighter (not in any trained sense of the word, just by nature), who has had some nasty things happen to her but she doesn’t let that beat her. She may get knocked down but she gets back up and for that simple fact I would read more about her. The brothers are interesting, they all have very different personalities but under all the brotherly dysfunction is a strong bond of loyalty that they need to survive. At first glimpse you may be inclined to dismiss yet another love triangle story but don’t. The characters are interesting, the romance is barely a sub-plot, and it seems more about the confusion of possible relationships than the angst of being in one or torn between two guys. 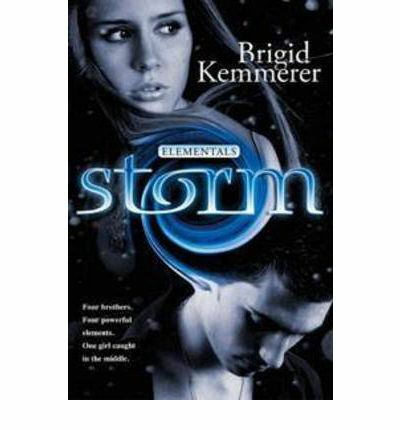 The overarching story of the elementals is quite entertaining. I enjoyed this book more than I thought I would and am looking forward to reading the sequels. If you are looking for something with proactive females and some interesting paranormal abilities then give this a go. With the reveal at the end it is going to be interesting to see where this story goes.